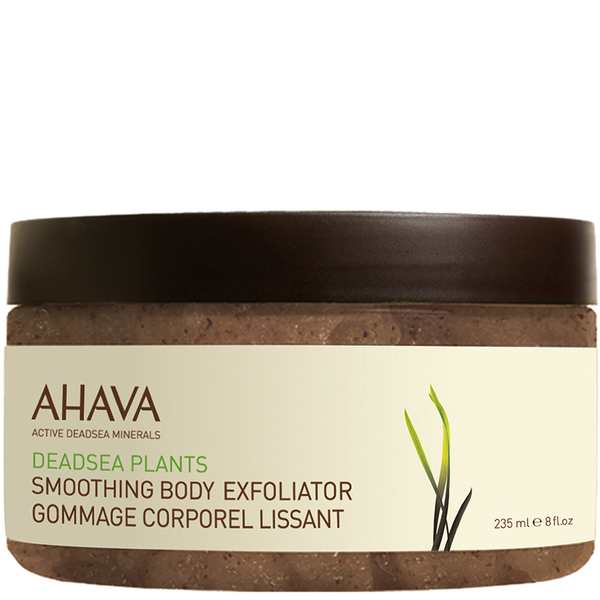 Improve texture and tone with AHAVA's Smoothing Body Exfoliator; a skin-refining formula that works to soften, nourish and enhance radiance all-over the body. Enriched with a luxurious blend of Dead Sea Salt, Moroccan Argan Shells and Sugar Cane, the scrub gently buffs the skin's surface to dissolve dead skin cells and impurities, leaving the body revitalised and refreshed without over-drying or uncomfortable tightness. Massage using circular movements on wet body in the shower. Rinse off throughly. Also recommended for hands and feet. Glycerin, Sucrose, Propanediol (Corn derived Glycol), Molasses Extract, Maris Aqua (Dead Sea Water), PVP, Macadamia Seed Oil Glecereth-8 Esters, Maris Sal (Dead Sea Salt), Aloe Barbadensis Leaf Juice, Vitis Vinifera (Grape) Seed Powder, Argania Spinosa (Argan) Shell Powder, Allantoin, Bisabolol, Cocamide MEA, Propylene Glycol Dicaprylate\Dicaprate & Vitis Vinifera (Grape) Leaf Extract, Parfum (Fragrance), Phoenix Dactylifera (Date) Seed Extract, Origanum Vulgare (Oregnao) Leaf Extract, Tris (Tetramethyl Hydroxypiperidinol) Citrate, Limonene, Linalool.